A lightweight expandable carry-on that has all the features. This case is a great size for weekend and overnight trips. It expands adding even more packing capacity. The long push button handle provides one hand operation, the tote-a-long clip allows additional bags to be carried effortlessly and the unbelievably light weight frame makes traveling a breeze. On the Outside, this piece has Delseys lightweight graphite frame, the same used in the construction of golf clubs and tennis rackets. Main material is constructed of durable Bullet Proof Ballistic Dupont® Teflon® protected Nylon with EVA foam backing. 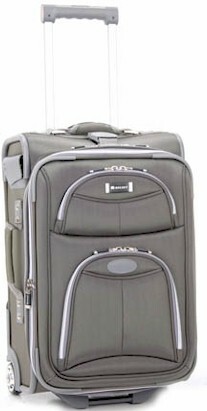 Trolley cases feature a Travel Sentry TSA Approved combination lock for convenience and security while traveling. Trolley E.x.p.a.n.d.s. up to 3 inches which allows for additional packing space if needed. The collection is unbelievably lightweight yet fully featured. In the Inside, this piece has room for hanging formal wear as well as lots of interior room for packing clothes and shoes; the outside pockets provide room for personal items, toiletries, etc. All Delsey Luggage pricing includes Free domestic shipping and more. Also, no sales tax if shipped to anywhere outside the state of Michigan. On line ordering is of the highest level secure format. We have been in business for over 50 years and offer 30 day Money Back Guarantee. All Delsey pieces are backed by Manufacturer's Warranty.